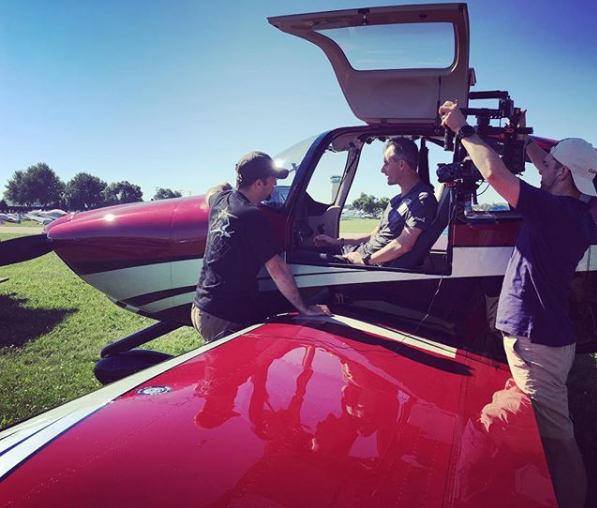 Air Race Pilot and Garmin Pro, Pete McLeod, interviews Ed at OSH '17 - Good. Plane. Living. So what’s EVEN better than another fun year at Oshkosh?! Another fun year at Oshkosh AND getting to talk airplanes with Pete McLeod IN YOUR OWN AIRPLANE!! Ed had the great pleasure in Oshkosh this year to meet Pete (Red Bull Air Race Pilot and Garmin Pro). Pete was doing a fun Garmin video feature on some of his favorite planes from Oshkosh. EJ even gets a little screen time too. Garmin and Pete were just awesome. These guys are the best! We’ll also be doing a little Oshkosh compilation soon with some fun footage from this year. More to come! For now, check out this rockin’ Garmin feature — our airplane is the first in the segment. We Flew the Rv10 to TX speedway and saw Pete race in 2014. He did a great job and was ranked 4th when we saw him. Tough weather then with a tailwind because of storms to the north. I am sure he remembers because of disqualifications of many pilots because they were being pushed into a pull up before a certain distance to highrise bldg. They are as fast as an RV10!!! Hah.